At the risk of sounding revolutionary, I am for changing Thanksgiving to October, on the same date as the Canadian Thanksgiving. It is silly to have a country so close to us and the Thanksgiving dates so different. It would be like having two different Christmas Days. Also, the last Thursday in November is not the harvest nor the end of harvest. By then, the harvest is long gone and the leaves have rotted and you can barely find a pumpkin around here. The October date would be so much better. It is now only about four weeks til Christmas. People complain about the stores promoting Christmas in November before we have celebrated Thanksgiving, but I can see why they do it. There just isn't much time between those two holidays. I am seriously considering having my Thanksgiving in October. I looked up the history of the way it became the 3rd Thursday in November and it is not a very convincing reason, Its not set in stone, so it would be a good idea to get Congress to change it officially. However, in the meantime, I'm going to change it for my home so that it coincides with the Canadian Thanksgiving. Even though I am a US citizen, my mother was Canadian and my cousins live in Canada. It would be nice if we shared the same holiday. I hope everyone had a nice Thanksgiving regardless. Mr. S. was wanting me to get out the lights and decorations for December, a few weeks ago in early November because it gets so dark here. I was putting it off until Thanksgiving was over because the decor didn't go with the event. October would be more in keeping with the harvest. I agree, Lydia. 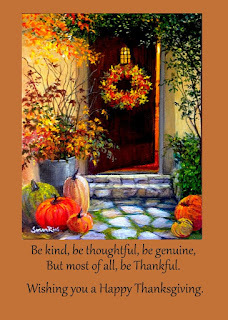 I am Canadian and I think having Thanksgiving in the beginning of October is perfect - it's just when the harvest season is coming to a close but the leaves are still on the trees, plants are still in the garden and abundance is all around. Why haven't we done this sooner? Your idea is brilliant, of course. I agree with you. I'm Canadian and love the fact that our Thanksgiving is in October. It just make sense - the harvest is gathered in, the leaves are perfect, and it gives everyone some breathing room before holidays begin again in December (or November for some people). And yes, I put up twinkle lights throughout the house starting in November because it does get so dark and dreary in the later afternoon/evening. There's something cozy about those lights, and they are not Christmas lights, just 'fairy' lights. Good idea! Though people make such a big deal about Halloween that you would be running into another holiday! It would certainly be easier to go the homes and friends and family when the weather is nicer. We had to drive through such heavy rain it was hard to see the road! Hope you had a nice Thanksgiving this year and are ready to enjoy Christmas. Don't give up! Sarah Josepha Hale lobbied for two decades to get Thanksgiving recognized as a National Holiday; Lincoln responded with a Thanksgiving Proclamation; but the National holiday didn't happen for another eighty years. I certainly agree that October would be better in many ways, although "harvest" doesn't happen at the same time throughout the USA. I grew up in San Diego and we grew things all year; now in Minnesota (and Iowa where we lived for seven years) harvest means corn and soybeans and they can be brought in anytime from September to December depending on the weather. Doesn't matter when it happens, Thanksgiving is my favorite holiday: being with loved ones, good food and gratitude! No presents, no costumes, no decorations, no parties and pageants, just a lovely day to remember all my blessings! Another Canadian chiming in here. Early October is a stunning time to be thankful; the bounty is all around. The leaves are still full of colour, the temperature was 65F or so this past year, so perfect for walking about and enjoying everything. Can you share where your mother was from? "I am seriously considering having my Thanksgiving in October." Here Here! That would be so great. I have been ruminating on the same topic this year. It would make so much more sense to have Thanksgiving during the harvest, and then more time for Christmas activities (plus there can be snowstorms in some parts of the country in November, which makes Thanksgiving travel home to loved ones even more of a burden). This also seems to coincide with the time change (fall back) which was moved from the last Sunday in October to 1st Sunday in November. I already know some people throughout the nation who are doing it, and I think the practice will be the ultimate change in things, not an act of congress. Thanks for providing the history, There might be two thanksgivings for awhile, as there are the colleges and instututions that have the November date in their student vacation breaks...and wouldnt a change in the date be great for airline travel! Not such a rush. I have loved this idea , and I know no Canadians ! LOL I actually had our Thanksgiving one year in October , but one family member disapproved and then demanded it AGAIN in Novemeber...and I had actually done it especially for him as his children were to spend Thanksgiving with their mother that year and he had been telling the whole family he was upset that he couldn't spend the Holiday with them , so I picked a day that he had his kids to celebrate.. oh well I tried, but I thought it was a GREAT idea then , and still do !!! I’m all for replacing Halloween with Thanksgiving because the former has devolved into such a morbid holiday. I think this is an excellent idea. I wonder if I could get my family to go along. Hmmm. The children might, if it meant they could have Christmas music much sooner. It has also been suggested that Thanksgiving be changed to replace Halloween. The fall is at it's colorful best on that time, with a beautiful harvest moon. Historical costumes could becworn and the children in the community would have a more wholesome celebration of harvest time. I’m so thankful for your blog Lydia. Keep up the good work. You are such a blessing.